Templateplazza is a joomla template club, a website that provides premium templates for joomla with a membership based system. Once you registered you can download all the available 60+ templates. The registered members can download all the available templates (including the upcoming releases in their membership period), give it a ‘test drive’, and find the most suitable template for their needs. Update Feb-20-2012: Sorry! 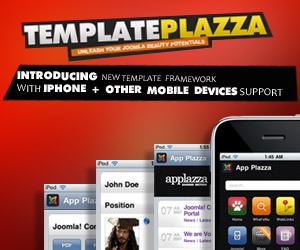 Template Plazza has been closed now! JoomlaBamboo develops clean and elegant Joomla templates. It releases about 1 theme per month. You will get access to all the past templates and the new ones developed over the course of your membership period plus options such as template rebranding, the quickstart express service or premium paid Joomla support. Joomladesigns Membership Club has wide variety of high quality Joomla web designs and offers access to download the Joomla templates and photoshop PSD files plus the new designs released over your membership period. Joomladesigns release 2 professional templates every month, offering you choice and value for money. Offer professional and responsive support via the support ticket system, knowledge base, tutorials. JoomlArt also provides Free premium quality Support with options such as Forum support and 24 hours Email support. You will also provided with great tutorial + Detailed userguide. Currently the club has about 90+ templates. By joining the JoomlArt Joomla Extension Club, you can download and use all the released and future extensions as well as other Joomla products during your membership period. There are 10 extensions as of now and more will be added soon. JoomlArt Magento Templates Club is now open. It provides the same high quality design as their Joomla templates with great features like CSS3 powered, lightweight, easy to customize, Multi color/theme options, Forum & Premium email supports and At least one new template every month.